November | 2018 | Papers, Please! November 2018 – Papers, Please! There is still no way to find out whether there’s a record about yourself in the national REAL-ID database, or what information that record contains, or to correct it. This has been recognized as a priority by the state officials who indirectly “govern” the contractors who operate the database. But years have passed, and nothing has been done to address the problem, even as the database has grown to include information about more than 50 million US residents. The most significant requirement for US states and territories that choose to comply with the Federal REAL-ID Act of 2005 is participation in the national ID database, SPEXS. But while SPEXS has been developed to enable state submission to Federal requests, development and operation of the SPEXS has been outsourced to the American Association of Motor Vehicle Administrators, a nominally-private nonprofit corporation, and a for-profit AAMVA contractor, Clerus Solutions. 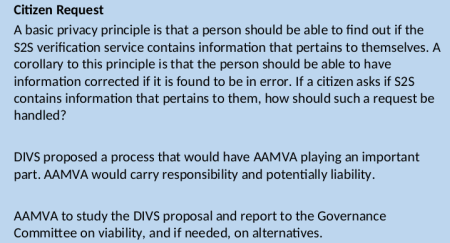 Neither AAMVA nor Clerus Solutions are directly subject to any Federal or state government transparency laws. Federal funding for SPEXS from the DHS has been laundered through grants to states, keeping the Feds at arms length from AAMVA, Clerus Solutions, or any direct oversight of, or accountability for, SPEXS. We have requested DHS records of these grants, but the DHS has yet to produce them. Just today — well after the deadline for the DHS to respond to our request — we got a message claiming that the FOIA office to which our request has been referred isn’t sure what we want, and asking us to “clarify” our request. In the meantime, the main sources of information about the build-out of SPEXS into a comprehensive national database of drivers licenses and state-issued ID cards have been responses to requests to state driver licensing agencies (DLAs in AAMVA-speak) under state public records laws. If you want to request these records from your state DLA, here’s a 2017 list of state points of contact for participants in SPEXS and the AAMVA subcommittee for privatized “governance” of SPEXS. This list is part of the latest batch of records released by the Wisconsin Department of Motor Vehicles (the first participant in SPEXS) in response to a request under that state’s open records law. Among other details, these records confirm that as recently as August 2017, AAMVA still had not agreed on any procedure by which an individual could find out whether there is a record about them in the SPEXS database, or what information it contains. No system for handling access or correction requests had been established, even though by that time the SPEXS database contained information about 50 million people.